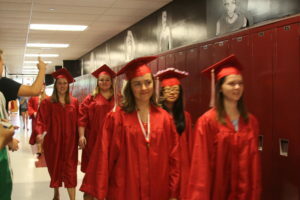 Wednesday, June 1, saw the beginning of a new tradition at Avonworth; the Senior Walk. 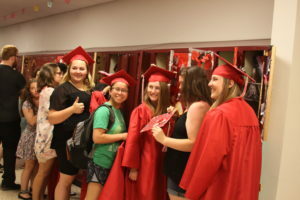 Before their graduation practice, the Class of 2016 walked the halls of Avonworth for one of the last times. All photos below by Jordan Cassidy. Jenna Foster (left) leading part of the class of 2016 through the math/science hallway. 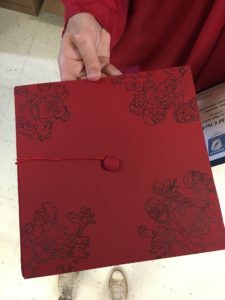 The class of 2016 started the 1st Senior Walk at the primary school around 9 a.m, before visiting the elementary school and eventually returning to the high school at 10 a.m.
Sara Svoboda was one a few students who personalized her cap. 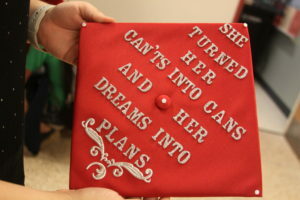 She added this message and ornamentation onto her cap for Friday’s ceremonies in the gymnasium. Avonews cartoonist David Clark displays his personalized cap, featuring all of his characters from various cartoons he created throughout high school. Also in the photo is his Honorable Mention certificate from the Keystone Scholastic Press Association, one of a number of regional and statewide awards David won through his two years of contributing to the Avonews. From left to right, Corinne Shipton, Hannah Grachen, Rachel Berg, Savannah Stanley and Kiersten Giovengo finish off the 1st ever Senior Walk with excitement for the upcoming graduation ceremony two days away.